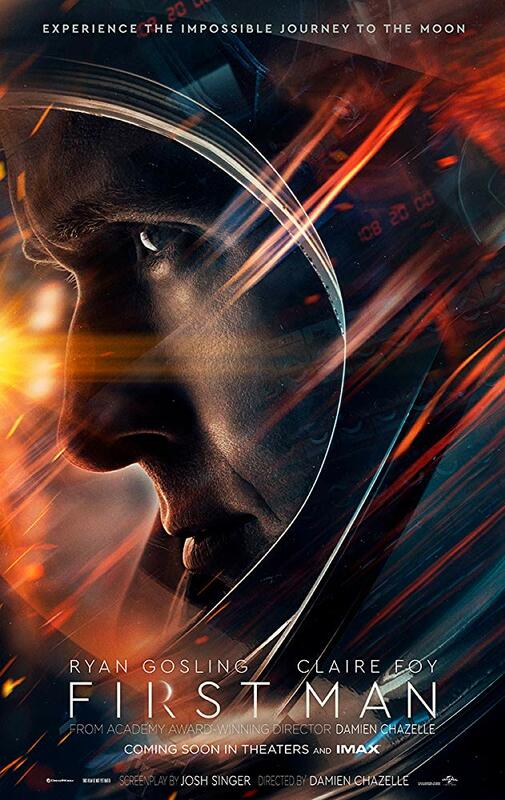 On the heels of their six-time Academy Award®-winning smash, La La Land, Oscar®-winning director Damien Chazelle and star Ryan Gosling reteam for Universal Pictures’ First Man, the riveting story of NASA’s mission to land a man on the moon, focusing on Neil Armstrong and the years 1961-1969. A visceral, first-person account, based on the book by James R. Hansen, the movie will explore the sacrifices and the cost—on Armstrong and on the nation—of one of the most dangerous missions in history. The cast also features Jason Clarke, Claire Foy, Kyle Chandler, Corey Stoll, Ciaran Hinds, Christopher Abbott, Patrick Fugit and Lukas Haas. UNIVERSAL PICTURES Presents. In Association with DREAMWORKS PICTURES and PERFECT WORLD PICTURES. A TEMPLE HILL Production. A DAMIEN CHAZELLE Film. RYAN GOSLING, CLAIRE FOY, JASON CLARKE, KYLE CHANDLER, COREY STOLL, PATRICK FUGIT, CHRISTOPHER ABBOTT, CIARÁN HINDS, OLIVIA HAMILTON, PABLO SCHREIBER, SHEA WHIGHAM, LUKAS HAAS, ETHAN EMBRY, BRIAN D’ARCY JAMES, CORY MICHAEL SMITH, KRIS SWANBERG. Executive Producers STEVEN SPIELBERG, ADAM MERIMS, JOSH SINGER. Produced by WYCK GODFREY, p.g.a., MARTY BOWEN, p.g.a., ISAAC KLAUSNER, DAMIEN CHAZELLE. Based on the Book by JAMES R. HANSEN. Screenplay by JOSH SINGER. Directed by DAMIEN CHAZELLE. Dont miss out on getting a ticket!